The Wilkes-Barre/Scranton Penguins faced several challenges in the month of November, including numerous roster changes and their first three-game losing streak of the season. But through it all, they kept their spot as one of the best teams in the Eastern Conference and the East Division leader. Let’s take a look back at how November went for the Pens before they begin play in the final month of 2013. Forward Nick Drazenovic is out of the Penguins lineup with an unspecified injury. Peter Merth and Pierre Letourneau-Leblond returned to the team after missing time. Several WBS players have received NHL playing time this month. Gibbons received his first career call-up and scored his first NHL goal in his debut. Zach Sill, Chris Conner, Jayson Megna and Simon Despres are all currently with Pittsburgh. The holes in the lineup have led to more call-ups from the Wheeling Nailers of the ECHL. Dustin Stevenson, Cody Sylvester, Denver Manderson, Carter Rowney and Eric Hartzell are currently getting playing time in the AHL. On the goaltending front, Peter Mannino was suspended from the team for failing to report to Wheeling. However, he has not been formally let go. Deslauriers signed an AHL deal on November 29 after starting the season on a 25-game tryout. In the second of a two-game set with St. John’s on November 23, the Penguins scored four goals in the third period to win 5-2 after being down 2-1. Bobby Farnham had his first goal of the season, and three players had two points apiece. Zach Sill also scored in his first game since returning from Pittsburgh. On November 10, the Penguins lost their third game in a row for the first time this season when they fell 4-3 to the Springfield Falcons. They allowed the Falcons four power plays in the first period, and Springfield capitalized on two of those. Former WBS captain Ryan Craig, who has the same title for the Falcons, scored the game-winning goal under five minutes after Simon Despres tied the game 3-3 in the third. This month’s award goes to goaltender Eric Hartzell, who made his first two AHL starts after being called up from the Nailers. The rookie was successful in both, even posting a shutout over the Senators on November 29. He is 2-0 with a 1.00 GAA and .964 save percentage. The Penguins will play the Utica Comets for the first time in Utica’s franchise history on December 14. The Comets, the AHL affiliate of the Vancouver Canucks, are off to a slow start with a record of 6-11-1-1. Forward Cal O’Reilly, who played 21 games with WBS in the 2011-12 season, recently signed with Utica after starting the season in Russia. He has three points in his first five games. On December 27, the Pens might see a familiar face in Norfolk’s net. Brad Thiessen, who won the AHL’s Baz Bastien Award in 2011, joined the Admirals after being released from his contract in Finland. 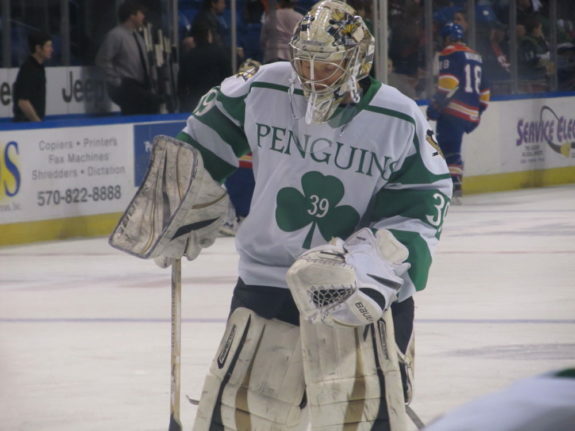 While playing with WBS in 2012-13, he had a record of 16-12-2 with a .902 save percentage and 2.68 GAA.